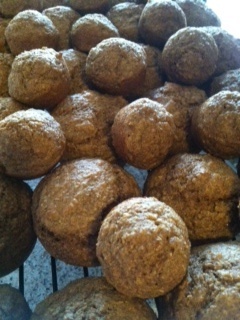 Before you think I'm crazy for posting a recipe for Bran Muffins, just trust me that they are actually really good! I've had bran muffins in the past and never been a big fan, but these are so tasty, my 5 year old actually thought they were cupcakes. Being the true sweets connoisseur that I am, I wouldn't go that far... but these really are very good!! Mix all ingredients together. Spray muffin tins with non stick cooking spray. Fill muffin tins 3/4 full and bake at 375 degrees for 12-15 minutes, or until a toothpick comes out clean. *You can also easily add nuts, or even chocolate chips. My kids (and husband) loved them plain! Also yummy with a little honey drizzled on top! Recipe Courtesy: my good friend Becca T.
Numnum num totally trying these!